Our favorite discount “five plus two nights free”, this discount is valid until the 2018 for all our guests, just book our apartment. Very good example: 7 nights for 375 € for 4 persons, equal great price. 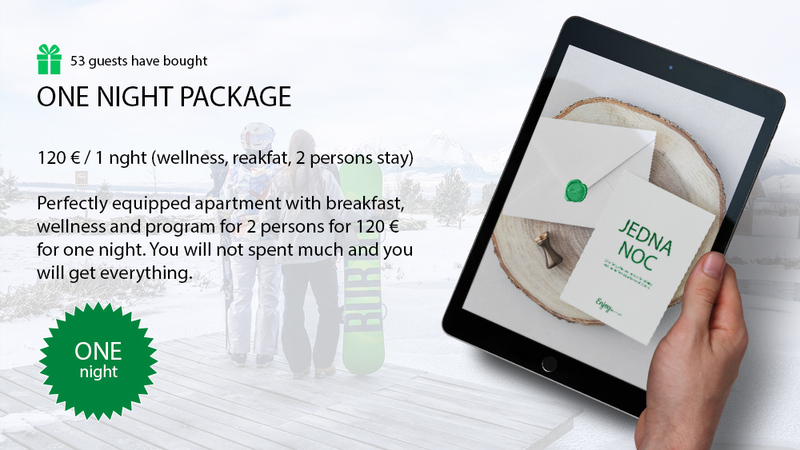 Pleasant Snow Package for 2 people where you will get 2 times a wellness entry, 2 x 1 day ski pass and 2 breakfasts. Pleasant Snow Package for 4 people where you will get 4 times the wellness entry, 4 x 1 day ski pass and 4 times breakfast. Whole perfectly equipped apartment with breakfast, wellness and a program for 2 persons for 120€ per night. Yeees, all year 2019 – BLACK FRIDAY 2019 – Book on Friday, Saturday, Sunday through the reservation form and get a 10% discount on the entire stay and packages.